Academy opened its own facility, the largest dedicated volleyball facility in the Region, from October 2011. Academy runs all programs and events in this 40,000SF state-of-art, fully-conditioned (with AC) facility that has 9 full-size volleyball courts, dedicated workout area, office/restrooms, meeting room, storage room, training equipment and a gym shop. Generally, the facility operates all weekdays starting from 3PM and most weekends throughout the year (please check "Academy Calendar" before visiting). 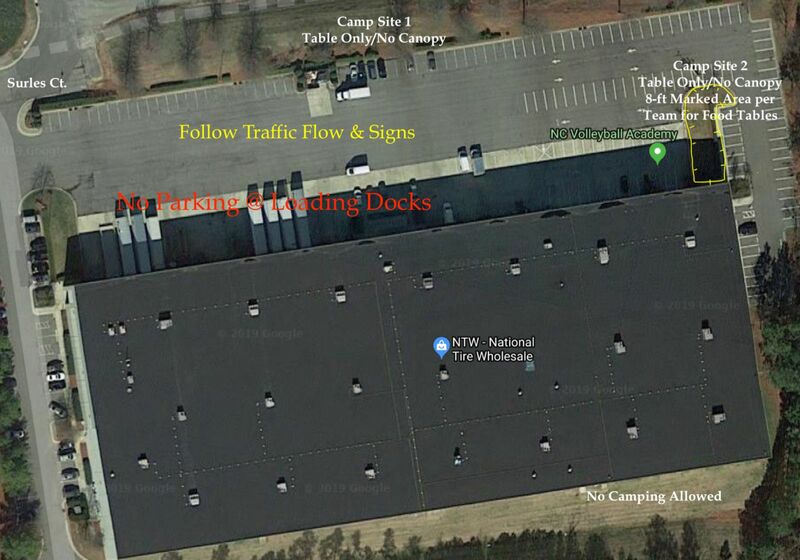 The new facility is centrally located in the Great Raleigh area near RTP (Research Triangle Park) in Imperial Center with easy access to I-40, I-540 & HWY 54. Please drive to the end of Surles Ct, and facility is in the building (warehouse) on the right. Parking is located in front of facility. It is important to know that you DO NOT block the the traffic of other cars/trucks of our neighbor's business operation. Academy's fully conditioned (w/AC) facility is ideal for variety of activities. For rentals, please contact Andy Cheng.